With winter setting in fast, West Michigan skiers and snowboarders rush to the slopes. Whether it is someone’s first time on the slope or they are avid shredders, finding a hill that is nearby but meets the skier’s personal needs is a must. Downhill skiers prefer steep slopes; whereas, freestyle skiers prefer terrain parks. The quick 45-minute drive might tempt a Holland skier to ski Bittersweet Ski Resort, but with some research, it might be beneficial to drive the extra hour and a half to Caberfae. Not all hills are designed for all skiers. To find a suitable hill, skiers must take in mind their style. Caberfae and Bittersweet don’t differ wildly, but just enough where choosing the wrong resort could cause a not-so-fun experience. Skiers that focus more on downhill skiing would fit in at Caberfae, whereas, terrain park skiers would prefer Bittersweet. Despite the lengthy ride, Caberfae offers 495 ft of vertical lift and a backcountry that skiers cannot get at many other resorts in Michigan. Since ski resorts in Michigan are relatively small, skiers don’t typically get to go backcountry skiing. However, Caberfae offers this unique experience. Caberfae backcountry is an untouched section of land that gives skiers the opportunity to create their own lines and ski in fresh powder and trees. 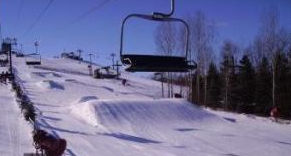 Caberfae features steeper slopes than Bittersweet, which attracts the mountain skiers. “Caberfae runs are quicker but longer. The slope is steeper so I can catch more speed than I can at Bittersweet,” Sr. Ethan Stam said. Although roughly equal in size, Caberfae hills allow skiers to catch more speed which is what downhill skiers enjoy. Although Caberfae fits the needs of downhill skiers, the hill is not built for terrain junkies. Caberfae only features a series of three boxes and two rails. However, Bittersweet includes five sections of rails and boxes while working in two-quarter pipe jumps to a flat jump. Terrain park enthusiast will agree Bittersweet has a better terrain park. “I was up there [Caberfae] opening day and there was nothing. Not a single rail,” Sr. Owen Houskamp said. The hills were nice and ready to go but no terrain parks were built yet. Finding the right hill is important for all levels of skiers. Caberfae offers the mountain skiers a little sense of freedom with backcountry while Bittersweet gives the freestyle riders multiple terrain parks. Randomly showing up at a hill can create serious disappointment. Next time you plan on heading to the slopes, do a little research to see what hill is best for you.